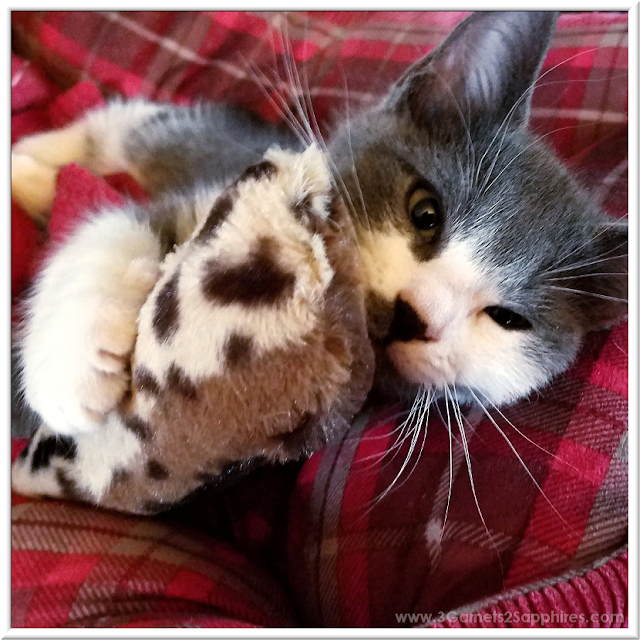 Since we adopted this pair of kittens in July, life has been interesting (and lots of fun). These are not our first kittens by any means, but they are the most mischievous kittens we've ever welcomed to our family. If you follow me on Instagram, then you already know that Yoda is the one with the big ears, and Kenobi is the one with the smudge of black on his nose. 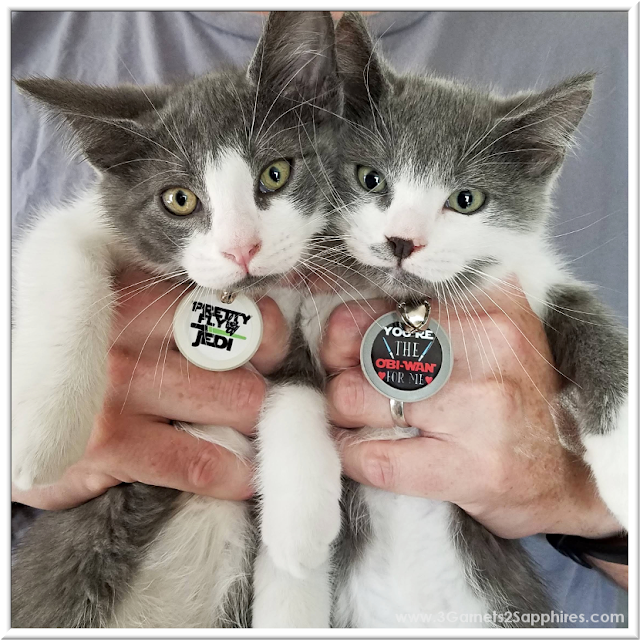 Although we had purchased some basic ID tags at our local pet supply store on the way to picking up these 9-week old brothers, we later decided we needed tags more fitting of their personalities. That's when my online search led me to stumble upon the TagNTrail shop on Etsy. This shop sells handmade pet ID tags, waterproof collars, and more. There were several Star Wars-themed pet tags to choose from, but I ended up with the Obi-wan pet tag for Kenobi because he's so lovable, and the Jedi pet tag for Yoda because he can jump so high that you'd swear he could fly. I had a great experience buying from this Etsy shop. I was able to choose the font color for our pets' names and contact info located on the back of the tags. The shop owner was even nice enough to change the lightsabers on Yoda's tag from red to green for me (because you know, Yoda's lightsaber is green). At first I thought the tags, which are about 1.25" in diameter, would be too big for our little kittens, but they were very lightweight and didn't seem to get in the way of their daily mischief at all. You have the option to ask for smaller jumprings if you have smaller pets. 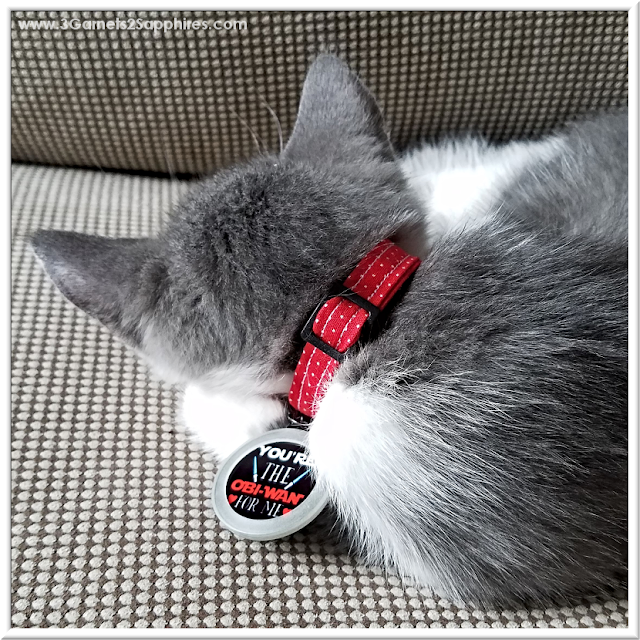 I forgot to do that (oops), but it worked out well for us to simply put the tags on the ring that came with the kitten collars. I'm pretty happy with these tags, and I'd definitely return to this Etsy shop next time I need dog or cat ID tags. More Etsy Finds . . .
Do you like to shop handmade? Share your Etsy finds with us in a comment here! Also, check out how these talented Etsy shop owners are Making It for some real life inspiration.